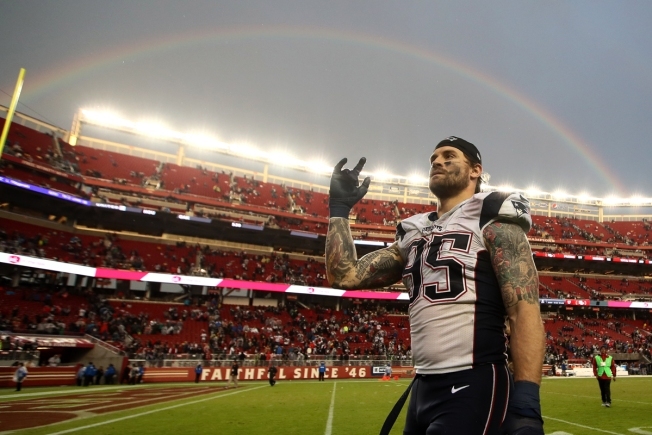 Chris Long #95 of the New England Patriots walks off the field under a rainbow after defeating the San Francisco 49ers 30-17 in their NFL game at Levi's Stadium on Nov. 20, 2016, in Santa Clara, California. The Patriots won 30-17. Defensive end Chris Long will be "moving on" from the Patriots this offseason, he announced Wednesday in an Instagram post. "Thank you Pats Nation," he wrote. "As a player you've given so much support to, I owe you an explanation as to why I'll be moving on." Long says that while he is extremely grateful for the opportunity the Patriots gave him, culminating in a Super Bowl victory, and to the "lifelong friends" he's made, he is now looking for a destination where he can play a bigger role. "This has zero to do with money," Long wrote. "It's the right move in my heart because I want to get back to being the player I was before. I'm thankful for my role this year, but as a competitor, I'm itching to do what I do best." In particular, Long expressed his gratitude to Bill Belicheck, who he affectionately called "the GOAT," for taking a chance on him. But he closed by again thanking New England fans. "It was important to say thank you personally," he wrote. "You may not remember me much, but I'll always remember y'all!! #driveforfive #missionaccomplished."